When this one came on Channel 5 I was very interested to see how it was going to turn out. Until the point it was first broadcast, Shane Richie has previously presented a Minder special for ITV and it was clear that he was a fan. The first part of the episode is dedicated to Archie getting to know Jamie for the first time. When the Gold Brothers finally catch up with them, Jamie soon proves that he is able to handle himself, which more than impresses Archie. Overall I quite liked this introduction to the series. It is loyal to the original and Archie is very much based on the frantic Arthur. Clearly they are not Arthur & Terry but the characters are intended to be based upon them and the love/hate relationship present in the original. This was a weak episode and probably one of the key reasons viewership was down and the series ultimately failed. Granted all the old fans tuned in, but no one new was going to get hooked on the show when the episode wasn't very exciting. Later episodes were much better, but I believe it was too late. They needed a good opening and this wasn't it. Perhaps it may have helped if Arthur had been mentioned, or little touches like a picture of Arthur on the wall of Archie's lock up and so on, also if it was made clear when we first meet Petra, she is Dave's daughter. Bottom line - I have never seen this series, should I bother? At a pound in Poundland it's got to be worth a punt! I'd avoid "In Vino Veritas" (2) and add it on at some future point. Watch that one second and you'll be put off, trust me. That episode starts off ok but soon turns into Carry On A Wedding Party Down The Thames and it is very poor (see the episode thread). The order above is highly recommended by me. Interview with Lex Shrapnel on Wednesday 14 January 2009 in the Bury Free Press. 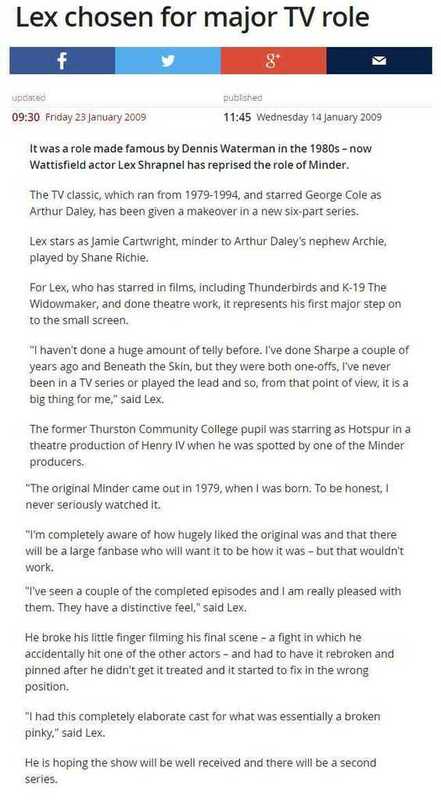 IMO, they should not have called it Minder and not used any references to the original Minder series such as the Daley name or The Winchester. They should have simply said the series is based on the original concept of Minder. Then maybe it would have been viewed more favourably without the inevitable comparisons to the original Minder series with which it could never compete. Judged as a series in its own right without the Minder references I think the series was ok.
Good points emmo26, but calling this Minder meant it was always on a hiding to the moon and back. I think Bradley Walsh could have done something similar. I think they should have gone with Arthur & Ray myself, with GC doing a cameo at the start handing the business on to Ray Daley or perhaps some younger brother Daley that Ray has to work alongside. Even Dennis as the boss, back from Oz working alongside Ray - I think with the right scripts any of these could work. None of this to slate Shane & Lex - personally I thought they were ok and this first episode was a good starter. I do think that Bradley Walsh would have been my choice out of the two actors (I always thought that Timothy Spall would have been great) but what really let it down was the scripts were just not strong enough in my opinion. The first & last episodes were the best out of the bunch. Overall, I thought this was a very decent series in its own right. Shane Richie was decent as Archie and Lex Shrapnel excellent as his minder. It had a fantastic supporting cast and deserved far better ratings. It certainly knocks Eastenders into a cocked hat and compares favorably with the likes of Hustle. Maybe, by calling it Minder, it was always on a hiding to nothing. However, I genuinely believe the blame for its poor ratings lies firmly at the door of Channel 5. Who, in their right mind, would pitch a series, predominantly aimed at men, up against Live Champions League Football? Thanks for doing this. When I watch this I will do it in the order your reccomend. I think really in retrospect, the Archie Daley Minder should be ranked along with BATTLESTAR GALACTICA 1980, DON'T DRINK THE WATER and THE GREEN GREEN GRASS, interesting continuations of a main series. Interesting what you said about the order of the eps jno because me and my folks gave up after episode 2. 2. Incidental music too loud, frequent and intrusive. 3. Some of the camera shots and general production seemed a bit too "Hustle"
I liked this. I was skeptical going into this episode and thought it was a good introduction to a new version of Minder. Archie is clearly related to Arthur Daley and learned well from his uncle. I thought Jamie was a good successor to Terry and Ray. A few times I felt the episode captured the tone and feel of the original series yet overall it has it's own style. It was a smart move to make this a revival rather than a remake. I just remembered this. The first time Jamie goes to see Petra there is a guy sitting at the bar that resembles Glynn Edwards. I wanted to see also how it turned out. Maybe they waited too long or the show didn't work out. Some of the things I didn't like or kind of bored me, they found places that represents London so much more to the point where the show felt like more of a movie then something for television. They featured the biggest London landmarks in the first episode and use it as a back drop to get viewers in the show. It's clear. They managed. It doesn't feel it was meant for television and they really lost all that feel. 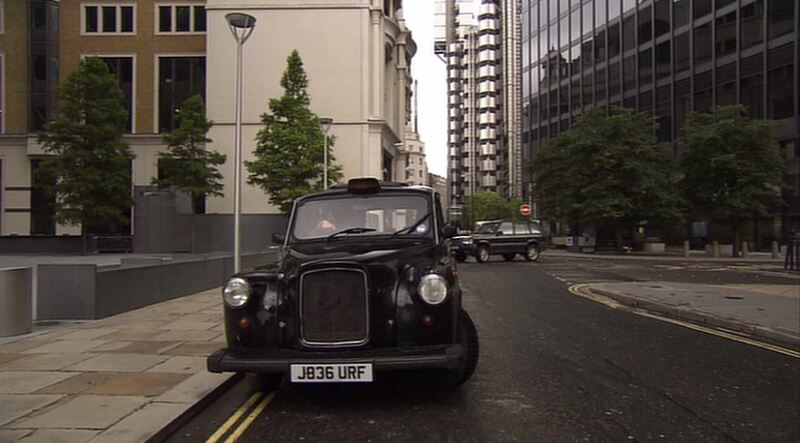 Like this scene here, London Cab just to draw attention because it's London and the Richard Roger's Lloyds Building in the background, because it's 2000s London. It feels like it didn't have much edge the parts of London had to attract the kind of viewers the original Minder had, in my opinion, Even at the time, I somewhat figured that out. I meet loads of yuppies around town, even at that time of this episodes production and I found them boring and quite annoying. They always found some good for nothing to do the work for them and would get rid of them then they got into trouble, because they can and they never got far but this is Minder, so it got me interested to see how this character would appear and be part of the series. They needed a character like that to take part. It shows but I wouldn't think many newcomer would understand Minder, unless they've seen Minder, but by that time, Minder was already considered date, so I wouldn't think many would have got it unless they did their research. Many don't, so I think it contributed to fall or interest or just never catched on. I just found Minder two months ago and even back then, I never caught on. I had to conscientiously watch this to find out and see for myself. Finally because George Cole isn't around to continue what Minder offered, it really lost that feel what Minder was known off. So that put me off this Minder a bit. However it is nice seeing what Minder would be like in the 21st Century, so that's a plus. 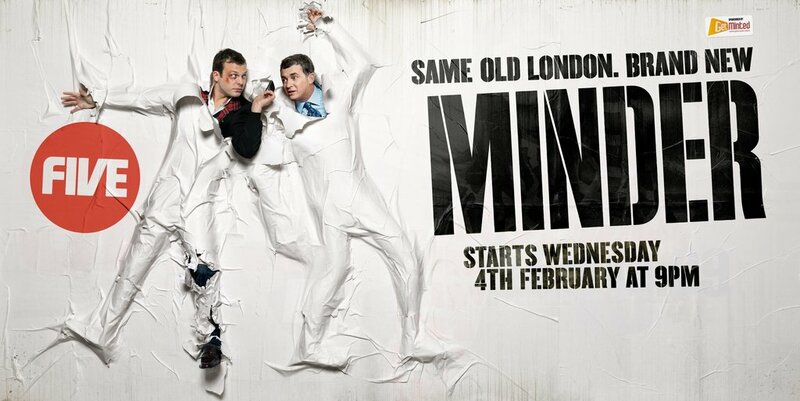 More like Brand New London, Same Old Minder. It's kind of not funny actually if I saw this and then watched the episode. I would of felt mislead. Was there any better way to advertise the series? A bit of a shame really. I gave it a go, as keeping Minder alive in any shape or form to me was a good thing. No comparisons granted, but was watchable. Did George Cole or Dennis Waterman ever comment on this version of Minder? I seem to recall GC did say "It's on Channel 5, what do you expect?" (or similar words to that effect) insinuating it wasn't worth the effort and he didn't like it. I thought this was a tad unfair myself but it seems I am in a minority who saw this as a next generation effort that didn't do a bad job, respected the original and didn't step on anyone's toes. If people were expecting Arthur & Terry they were always going to be disappointed. I am not sure where he said this and I would not trust the UK press too much. If it had been a remake I could understand George Cole's reaction. Judged on its own merits "Minder: The Next Generation" had some potential that unfortunetly wasn't fully realized in the few episodes that were made. I think that's very fair pr1.